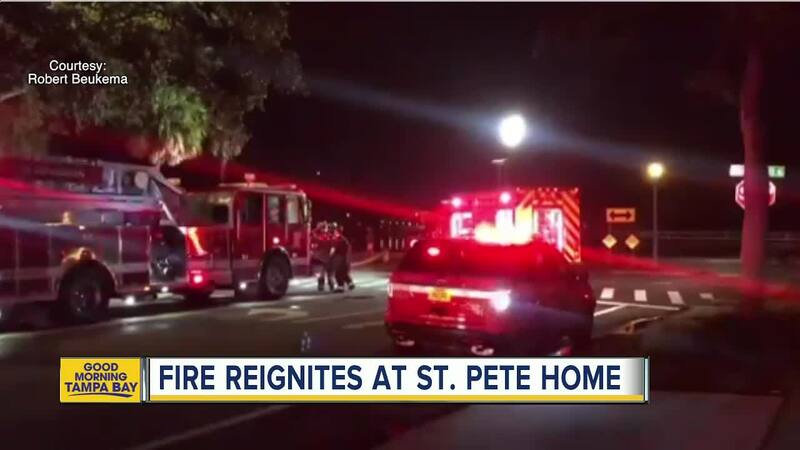 ST. PETERSBURG, Fla. — Investigators believe a lightning strike started a house fire on Coffee Pot Boulevard in St. Pete over the weekend. The St. Pete Fire Department responded to the home just after 6:30 p.m. on Sunday. The fire started in the attic and caused pretty extensive damage, according to officials. The homeowner was able to get out of the home. Firefighters had to pull down parts of the ceiling on the second floor to get into the attic. They say the fire also spread to the second floor. It rekindled a few hours later — an orange glow and smoke could be seen from the attic. Officials were able to put it out. Early Sunday morning, another home caught fire, but officials say it was an accidental fire caused by an electrical failure. They say the fire started in a bedroom.